This month I'm turning back to software treatments and this one is for you vinyl fanatics out there. I can call you that, if the term applies, because Im one myself. While it is no secret that I prefer the "sound" of vinyl, I am not foolish enough to think it is the ONLY way to listen. Quite honestly, aside from preferring the "warmer," more full-bodied sound, I feel it can offer a better value for collecting music - given three conditions. The types of music you listen to must be available on the format, you need have access to used vinyl and you must have some kind of deep cleaning system like a vacuum powered cleaning device. The last condition of needing a record vacuum just took on a new twist. But, Im getting ahead of myself. For years I have used a Nitty Gritty record cleaner with many different types of cleaning fluid, many of the most effective being of my own formulation. Last summer I stumbled onto Dr. Duane Goldmans web site at http://www.discdoc.com/lp.html and discovered a truly unique new record cleaner. It is based on modern surfactants, rather than alcohol. After a few phone calls to the Disc Doctor himself, I ordered up what proved to be something that has changed the way I have heard every record in my collection from that day forward! Available in numerous sizes, I ordered a quart bottle of the Disc Doctors Miracle Record Cleaner. A quart is said to be enough to treat over 600 records and is provided, along with the required LP sized applicator brushes, for $73.40. Given the number of records Ive cleaned already versus the amount of fluid left, Ive no doubt it will easily clean the number of records projected. You can order a pint, enough for 300 to 350 records, again with the necessary brushes, for just $59.90. The brushes are designed to accommodate the types of records you will be cleaning, so youll need to specify that at the time of the order. If you are going to be cleaning more than one type/size of record, youll need to get brushes for all of them. They are available for LPs, 45s and 78s and all sizes come with one set of replacement pads. I also got a set of Duanes special replacement pads for my vacuum powered record cleaner. One of the non-sonic advantages of this cleaner is that, unlike all those previously mentioned alcohol based cleaners, one application is all you should ever need. Once treated, you need only use a Carbon Fiber brush before and after each play, something you should be doing no matter what other form of wet cleaning you may be using now. Clean white cotton towels and/or washcloths (Duane says you can even use unscented toilet paper!). A counter top dish drainer and/or vacuum powered record cleaning machine. Since Dr. D provides his instructions for cleaning with the product, Im gonna run you through what I do. I lay out a clean, bath-sized white cotton towel on my kitchen table. I also use several small white cotton washcloths to remove excess cleaning fluid and distilled water when Im through. The reason for using a bath-sized towel is to allow for cleaning two records at a time. Im lazy and hate the excess time it takes only doing one at a time. Lay one record on the left half of the towel and another on the right. Make sure you have your drying towels handy and you are ready for the Miracle! The provided pair of cleaning brushes, with their velvet-like bristles, are identical. Since the point is to remove all of the fluid after cleaning, it is important to make sure you keep these two brushes identifiable and separate. The aroma of the fluid on them will let you differentiate them, but Ive chosen a more sure-fire method. Ive stuck a number 1 label on the handle of the fluid brush and a number 2 on the handle of the distilled water brush. Applying the fluid is a breeze with the supplied applicator bottle. Wetting the brush for the first use of the day will require more fluid than you will use on the following reapplication. Saturate the pad surface to the point of nearly having the fluid drip off the brush. Place the wet brush on the surface of the fist record so that it covers the grooves laterally, from the opening run-in grooves to the closing run-out grooves near the label. Be careful not to get any of the fluid on the label as it can cause discoloration. The required cleansing motion, moving the brush around the record in a semi-circular motion and keeping it on the grooved area, may sound as if it will require great dexterity. It doesnt! The nature of the brush material keeps it right on track while you simply guide its progress around the entire surface of the disc. The best method Ive discovered is to do one half of the record (or an arc of 180 degrees) for three full, side to side wipes. You dont have to press hard at all, merely keep a constant downward pressure on the brush as you traverse the disc. Then do the same on the second half. This will give you six passes, three in each direction, over the whole record. This is imperative in order to dislodge all the built up debris from the grooves of "pre-owned" vinyl and to loosen all the mold release agents from the grooves of brand new records. Yes, thats right, YOU MUST CLEAN NEW VINYL. Teflon and other like materials, which are used on the stampers to allow for easier release of the hot vinyl pie after pressing, are left in the grooves and must be removed. The brush may foam a bit as you move it around the record, indicating good, deep groove cleaning. When you lift it off, you may see a lot of interesting things on the brush itself. This is where the old toothbrush comes in. Use its handle as a squeegee to clean off the brush surface before applying more fluid for the cleaning of the second record. Applying the cleaner to the brush now will only require about 10 or 12 drops to rewet it sufficiently. Now follow the same application instructions as you clean the second record. Next, pick up one of your clean cloths or towels to pat away the excess fluid still on the record. Slowly pat the entire surface of the first record, and then move on to do the same on the second. SET THIS CLOTH TO THE SIDE AND MAKE SURE YOU ONLY USE IT AGAIN TO REMOVE MORE FLUID. You may facilitate this by using cloths of differing colors or by marking them in some manner, but it is imperative to not RE-APPLY the fluid once the initial cleaning has been achieved. Apply distilled water to the second brush till it is thoroughly saturated and lower it onto the surface of the first record just as you did when applying the cleaner. Repeat the steps used in applying the cleaner in exactly the same manner when cleaning with the distilled water. After you have soaked and brushed the first record, again squeegee it off with your toothbrush, then reapply distilled water and clean the second record. When done with the second record, clean the brush off one more time and set it aside. Take your second clean cloth and pat both records dry exactly as you did to remove the excess cleaner. Make sure you DO NOT use a cloth you have already used to sop up cleaning fluid, as it will simply re-contaminate your now clean record. Now, flip both records over and do the second sides just the same way. Once the second side is completed I use my record vacuum. I run both sides on the vacuum, removing all but the very last vestige of the distilled water. If you are not using a record vacuum, this is where the counter top dish drainer comes into play. Insert them into the dish drying rack and let them air-dry for at least half an hour. Once the record is dry, you are ready for some awesome sound. BE SURE THE RECORD IS COMPLETELY DRY! If not, some of the water may be drawn up your cantilever into the cartridge body and can cause irreparable damage. Looking at the freshly cleaned record, it is optically renewed. It looks bright and shinny, like it did the first time it left the womb of its inner sleeve. But the best is about to come! As you drop needle to groove you will hear your music for the first time! This is no exaggeration. Duanes literature states it very accurately; "For the sound you thought you bought." I could not believe the transformation and Im talking about records Ive listened to for decades, some going back nearly thirty years. Just about every thing gets better! With your pre-owned treasures, what previously appeared to be permanent surface noise (but was actually only accumulated crud in the grooves) decreases anywhere from two thirds to three-quarters on most pre-owned records! This allows the music to emerge from a "blacker" or quieter background. There is also a broad band unveiling, most easily likened to removing your speaker grills. The focus and resolution increase dramatically, greatly improving imaging and staging! The midrange becomes a bit warmer, especially noticeable with solo voices, human and instrument. High frequencies, especially on things like cymbal crashes, are full of air and detail. The most unexpected thing to me, however, was an increase in transient speed from the lower mid bass on down into the subterranean stuff. Drum and bass guitar passages had tremendous speed and impact. 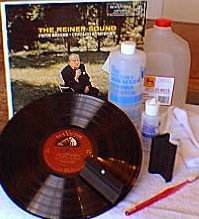 Keep in mind, this is on records I have cleaned repeatedly with a vacuum cleaning device and a variety of fluids over years and years. While the effect on new vinyl is not normally as pronounced in the surface noise department, it can have a significant effect. All the other sonic benifiets are there in spades. The improvements realized with this cleaner are not subtle to these ears. The changes can be equated to the dramatic differences I discovered when I first moved from a moving magnet to a moving coil cartridge. I have thoroughly enjoyed re-discovering the sixties, seventies and eighties on vinyl. Noises that were indiscriminate now become known sounds. Detail and articulation is astounding. Bass speed and solidity is breath taking. Thanks to Dr. Duane Goldman, my favorite music storage medium just got WAY BETTER.